Written by Vaughn Vernon, the DDD “Red Book” picks up where Evan’s “Blue Book” left off. This is especially prevalent in how Vaughn goes about explaining the importance Bounded Context, but unlike Evan’s book, gives code and design examples illustrating the thought process and skill evolution of an agile team building a project management/tracking/scrum software project (similar to TFS). I initially met Vaughn when I was a newbie to DDD years ago hanging out in the Yahoo DDD forum: https://groups.yahoo.com/neo/groups/domaindrivendesign/info. I had Fowler’s Patterns of Enterprise Application Architecture and Evan’s Blue Book fresh on my brain and had about a thousand questions that no one at my current job seemed to understand or even think was important. But I saw a better way to build software in those books and was determined to find the answers to my questions. Vaughn took the time to answer some of my questions I had posted to the forum (which much have been incredibly painful for him back then, because my questions were very naïve I’m sure!). After a couple exchanges on the forms, Vaughn, sensing I was new to DDD, asked me if I’d like to participate in giving him feedback on the DDD book he was writing. 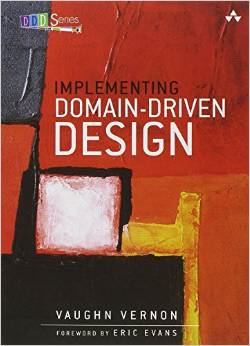 He said he valued the input of beginners and as well as experts, and wanted to write a book that truly could connect to any level and explain the intricacies of DDD and bounded context. I immediately said yes, and a week later, was reading rough cuts of the chapters of the Red Book giving Vaughn feedback and asking more questions as I went along. Anyhow, years later, here I am. Working for a company that is building software using NServiceBus and exercising the notion of bounded context, boundaries and DDD every day while coding.